The Cass County Sheriff's Office Regional Training Academy held their third culmination ceremony this month. The ceremony held in Harrisonville honored eleven graduates for their completion of the 648 hour law enforcement academy. The evening of recognition included accolades and scholarly advice from honored guest such as Cass County Sheriff Dwight Diehl and Gladstone Police Department Ret. Sergeant Becky Davis. Several recruits graduated in uniform from their respective agencies and were presented with badges. Belton Police Chief James Person presented badges to Dominic DiFiore, Trevor Liniger, Marvin Shaw, and Tim York. 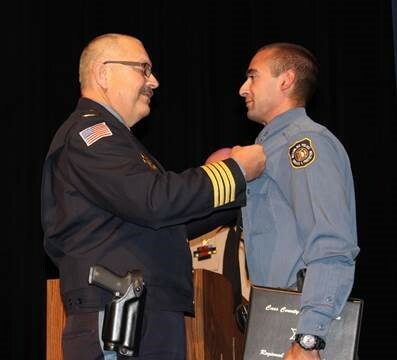 Recruit Austin Prindle was presented his badge by Gladstone Police Chief Mike Hasty. Bates County Sheriff Lieutenant Justin Corbin presented Chris Brison with his badge. Sheriff Dwight Diehl believes local communities benefit when local working law enforcement, judicial and emergency services professionals train new peace officers.